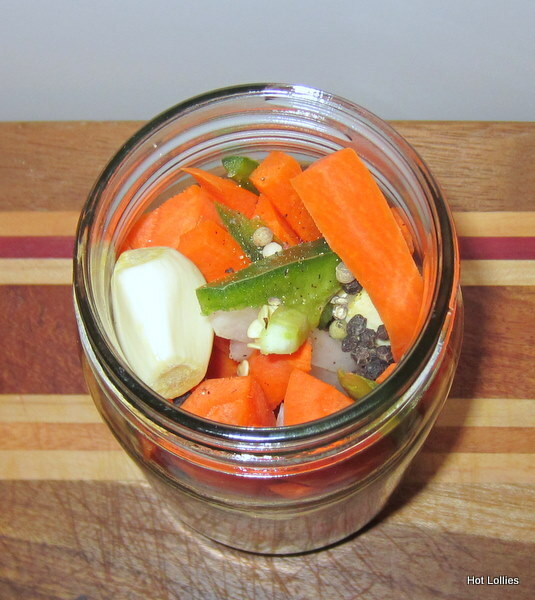 I’ve been wanting to pickle vegetables for a long time now after I read how easy it was to do. I’ve always enjoyed pickled carrots, peppers, green beans and cauliflowers…actually, it was the only way I would eat cauliflowers! The fact that they looked like mini brains didn’t help either but once I got passed that I enjoyed them in a whole new way. The pickling ingredients makes a huge difference so I picked produce that I like and used the right amount of spice. I bought a canning kit over a year ago to start makings jams and pickled veggies because I love handmade goods. 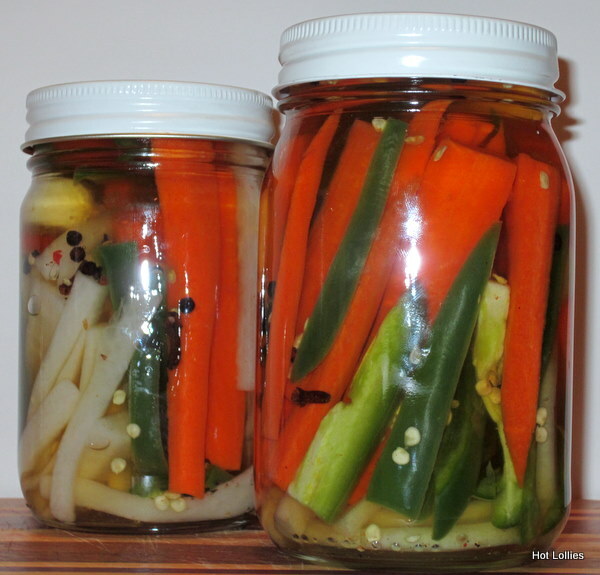 I quickly learned that you can make easy refrigerated pickled veggies without going through the whole process of boiling jars and lids. This recipe can be ready to eat within an hour or two but of course would taste much better if left alone for a couple of days. 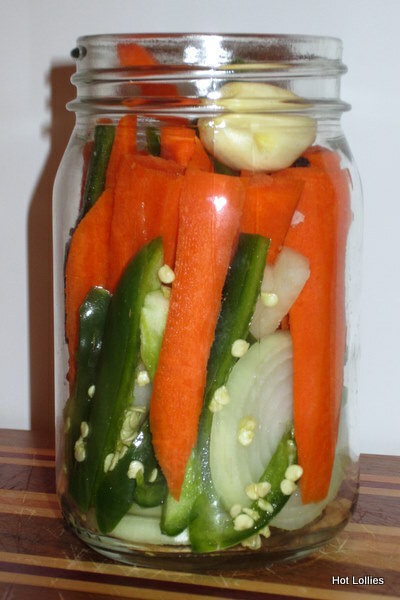 Pickling has been around for centuries as it was a way to preserve seasonal vegetables for the cold months to come. Today you can buy anything canned or bottled and the preservatives will allow you to enjoy it for at least a year but pickling your own is far better. It’s a great way for you to control the ingredients, control what you consume and prolong the life of some of your favorite produce…and it’s so good and all natural too. Once you make it the first time you can adjust the salt and sugar to your taste. You can snack on these veggies or spruce up any sandwich or dish for a bit of spice and tang. It’s also great for brightening up your salads by dicing the vegetables and topping or just tossing in some of the brine. I always have a lot of carrots for juicing or snacking and pickling them is just another way to enjoy them. I also had jalapenos on hand, of course, and daikon. Daikon is an Asian radish and is used in many Asian dishes. I rarely use it but I like the crunch and bought some to make a Vietnamese Banh Mi sandwich which I’ll share with you in a future post. If you don’t have any daikon you can substitute it with anything else really, like cauliflower, radishes or whatever firm produce you have on hand. First and foremost, wash your jars and lids in hot soapy water and let air dry. Bring to boil the vinegar, water, sugar and salt, stirring until sugar and salt are dissolved. Let stand until it reaches room temperature. In the meantime, wash all vegetables and cut as directed. Fill each jar with equal amounts of vegetables and spices. Just half everything and pack tightly into each jar as shown above. When liquid has cooled, fill each jar with liquid to the top until the vegetables are covered. Place lids on jars and close tightly. Refrigerate for at least 2 hours but best if left overnight or two days. The longer the brine the better the taste. These will keep for at least 3-4 weeks after opening.